Today, I am eating a few slices of toast with butter and honey for breakfast. I am very fortunate to have my friends Carla and Chris down the road so close by. They have their own bees and I feel so lucky that I can switch between their many types of unpasteurized honey for my toast slices! Are you able to tell that Brian and I love our Cinnamon Honey (creamed clover honey with added cinnamon) on a hot toast or in our morning oatmeal porridge? Look, we buy it in 3 kg buckets! The other two jars you see on the photo are in ‘little jars’… 1kg… on your right ‘Creamed Clover’ and on your left ‘Wildflower Blossom’. What a treat to have your very very local honey supply of Fireweed (Chamerion angustifoliumflower, comes often as one of the first plants after a forest fire) and Wildflower Blossom. 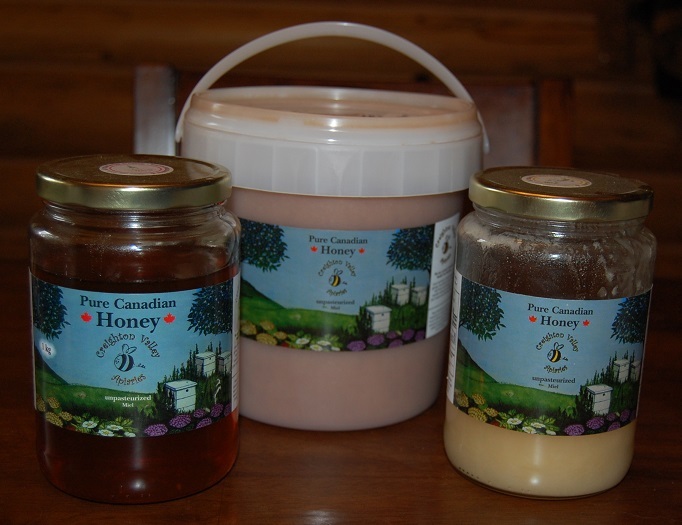 These two types of honey must be the most ‘organic’ honey I have tasted so far… the bees simply fly around in the wilderness of our region and are having fun. If you come and stay at our B&B, we will make sure that you get to taste the different honeys of our very own Creighton Valley Apiaries! We also buy our bee wax candles there. My friend Carla makes fantastic candles in all sizes and shapes and I love the smell of bees wax when I enter her little shop at 266 Creighton Valley Road. If you are planning to go and visit her store for some honey or candles, please, call ahead at (250) 547-9080 to make sure that they are home to let you into their lovely little store. Carla also has a stall on Saturdays at the Cherryville Farmers Market.